Back in the early 90’s Robert Carlyle emerged as one of the rawest and most accomplished of Scottish actors. After some TV roles, he came to prominence while working with Ken Loach in Riff-Raff and Carla’s Song before becoming a household UK name in the smash hit The Full Monty and then emerging as a Bond villain in The World is Not Enough. Audiences today might be more familiar with his work on TV’s Once Upon a Time but it could be said that Carlyle hasn’t quite reached his full potential in terms of the projects he has been involved of late. 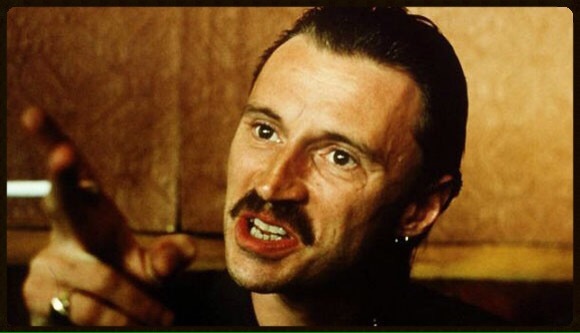 That said, there’s absolutely no doubting his chameleon-like abilities which was showcased in 1996 with his, now iconic, portrayal of Francis “Franco” Begbie in Danny Boyle’s Trainspotting. The film primarily focuses on the drug addled exploits of a group of friends in Edinburgh but “Begbie doesn’t do drugs. He just does people“. While his friends are injecting heroin, it’s through arbitrary acts of sickening violence that Begbie gets his kicks. 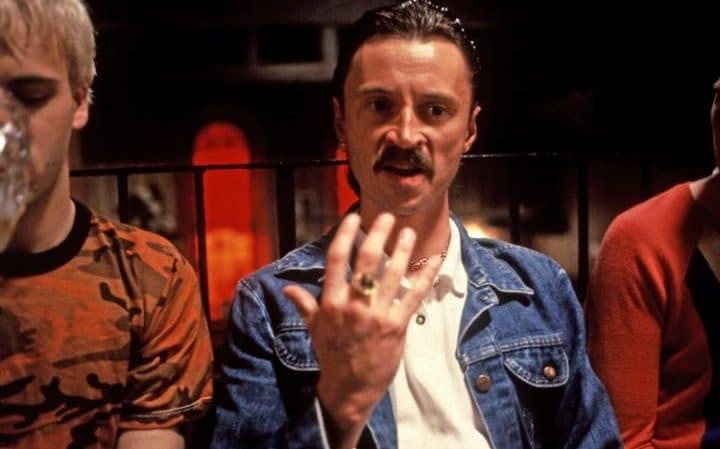 In a film filled with detestable individuals, Begbie is the standout and, without doubt, the film’s most terrifying character. He’s a highly volatile and unpredictable sociopath and Carlyle delivers a virtuoso performance. However, despite his alpha-male status Carlyle himself believes that this was down to Begbie’s repressed homosexuality and his “fear of being outed”. As a result, Carlyle personally chose to dress in Pringle sweaters, pink shirts and stay-pressed trousers. Not to mention the moustache that became more synonymous within the gay community. It was a decision that, a surprised, Danny Boyle agreed to go with and even Irvine Welsh (the author of the novel) agreed that Begbie could be viewed in this way; Carlyle’s understanding of this volatile character was very perceptive from the offset. The skill in Carlyle’s performance, though, is not just his ability to be malevolent, it’s his ability to do it in such a way that his portrayal of this character also contains a lot of humour. He manages that rare mix of being likeable yet extremely frightening by creating a genuine sense of unease and unpredictability whenever he’s onscreen. The volatility and sense of immediate danger that Carlyle brings to the screen cannot be denied. He has been likened to Joe Pesci and his menacingly unpredictable turn as Tommy DeVito in Goodfellas – another who turns scary and violent at the slightest provocation and causes a nervous disposition in the characters surrounding him. When the entire cast are operating at the top of their game, it can often be hard to single out one particular performance but Carlyle is so highly charged that every scene he’s involved in is absolutely gripping and, by that, there’s no bigger compliment to an actor. It’ll be an absolute pleasure to see him return to the role in the forthcoming Trainspotting sequel –T2. Oscars? – Despite Trainspotting becoming a cultural phenomenon, it was largely overlooked at the Oscars. John Hodge received a Best Adapted Screenplay nomination but Boyle’s kinetic direction and the sublime performances weren’t recognised at all. Robert Carlyle, in particular, would have been a solid shout for Best Supporting Actor. Sadly, it wasn’t to be. This entry was posted on January 23, 2017 at 9:35 am and is filed under Uncategorized with tags 1996. You can follow any responses to this entry through the RSS 2.0 feed. You can leave a response, or trackback from your own site. Spot on with this post. You tend to have to break through with Academy and then when you’re in – you’re in. 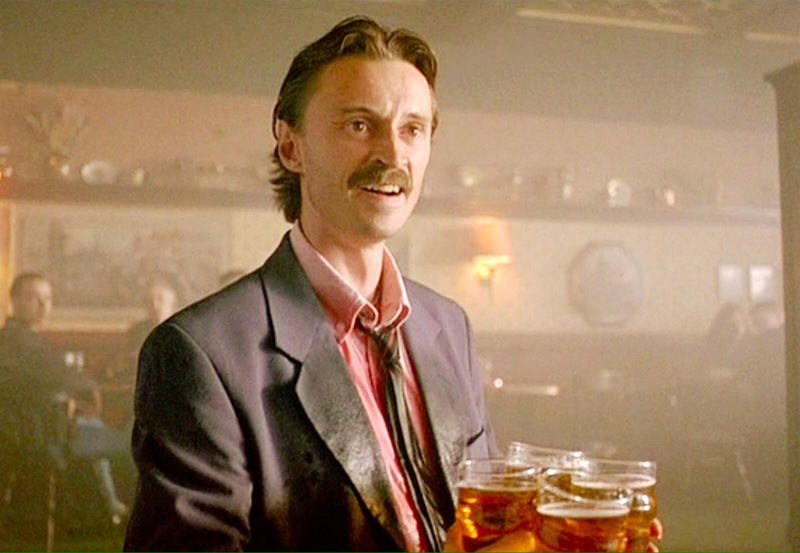 I remember the stark contrast between Begbie and his Full Monty character so close together. I never stopped to think he wasn’t a big buy, so well did he inhabit that sense of violence that he loomed as a terrifying person in the film. I couldn’t wait to see him face off against James Bond but that didn’t go as well as I had hoped. Thanks Lloyd. I totally agree on the contrast between his roles in The Full Monty and Trainspotting. Such polar opposites. I don’t know if you’re familiar with the UK Tv show Cracker with Robbie Coltrane? But he played a very psychotic football fan in that even before these two films and that role showed his intensity early on. I do know that he grew up in a working class background in Glasgow and his portrayal of Begbie has certainly came from his experiences here. The character is so like many people I’ve come across myself. Speaking of which, I actually met Carlyle in person and he’s a real gent. Absolutely nothing like Begbie at all. That would have been a thrill. Boy, is this an iconic performance. He’s terrifying and hilarious at the same time. Can’t wait to see what he does in T2. Still Carlyle’s best performance for me (and he’s done a few). I just love Begbie. What a character, man. I’m just about shitting my drawers to see T2. Really can’t wait! A tremendous performance. Man I want to see this film again. It’s just sublime from Carlyle. As it goes, I seen the sequel a couple of days ago and he’s great. T2 was not a disappointment for me and Carlyle was the highlight once again. Ive heard so much about the sequel man. Will bookmark your review to read later. The sequel has some differing opinions, man, but it worked for me. And I’m so glad I can finally say after such a long wait. I’ll be over to read it as soon as I can. Great stuff Mark! I think it is high time I pop this one in for another viewing!